We’re following Hugh Fearnley-Whittingstall on his brilliant mission to reduce the nations sugar intake whilst still managing to make a stunning impact with look and taste. 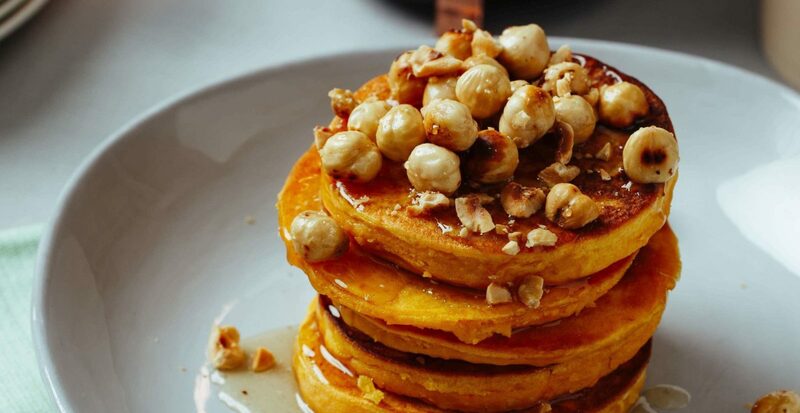 Desserts made with vegetables, such as my sweet potato and hazelnut pancakes, are beautiful inside and out. Cook the sweet potatoes in the oven until cooked through. Leave to cool, halve and spoon out the filling into a sieve. Place over a bowl to let all the moisture drip out for an hour. In a large bowl, mix the eggs, milk and butter and beat until smooth. In a separate bowl, mix the flour, baking powder, nutmeg and salt. Slowly combine the potatoes with the wet and dry ingredients to form a batter. Cook the pancakes in a lightly greased, pre- heated heavy frying pan until golden brown.